On December 15-16, 1862, on a raid at Whitehall, Union troops led by Gen. J. G. Foster damaged the Confederate Ram "Neuse." 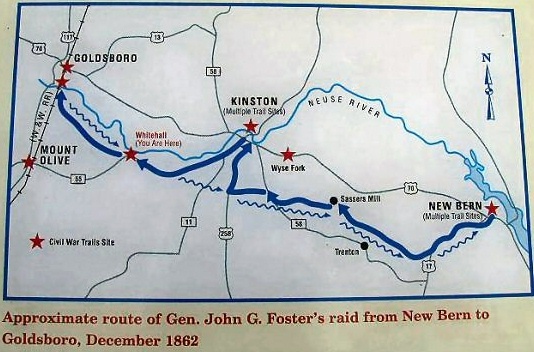 The engagement between Federal and Confederate forces at Whitehall (today known as Seven Springs) took place during Union General J. F. Foster’s raid from New Bern to Goldsboro in late 1862. 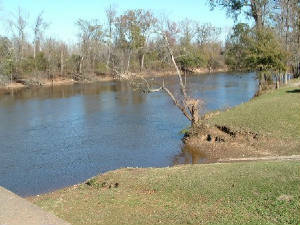 On December 15, Foster’s contingent of three companies of cavalry and several pieces of artillery entered Whitehall, which is located on the south bank of the Neuse River several miles above Kinston, hoping to capture or destroy the railroad bridge and confirm suspicions of Confederate ironclad construction on the river. Upon their arrival, they found the bridge burned by the Confederates in order to protect the ironclad and the opposite bank of the river occupied by several regiments of Confederate troops under the command of Brigadier General B. H. Robertson. During the ensuing battle, which lasted through December 16, the Federal artillery bombarded Confederate positions with such a barrage that the dense woods along the bank were cut down for a quarter of a mile back from the river and construction materials for the ironclad were damaged or destroyed. While Union and Confederate Forces occupied opposite sides of the river, a fierce artillery duel ensued. After the Confederates had burned the Neuse River Bridge (aka White Hall Bridge), they assumed position on the North side of the river. While the Union forces occupied a hill on the South side of the river, the two sides exchanged devastating artillery fire. Federal reinforcements arrived the next day and Foster placed them in exposed locations along the river bank, resulting in heavy casualties. Confederate casualties were low since geographical restrictions on the river at the site of the conflict allowed only one regiment at a time to engage the Federals. In addition to damaging the town and its river fortifications, the Confederate ironclad ram, the CSS Neuse, under construction on the north bank of the river, was damaged during the raid. 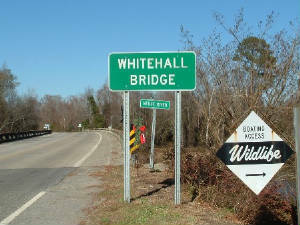 Eager to move toward Goldsboro about eighteen miles distant, Foster withdrew his forces from Whitehall during the evening of the sixteenth, confident that the bridge and ironclad were destroyed. However, damage to the Neuse was minimal and work resumed on the ironclad after Foster’s withdrawal. Local citizens were left with the tasks of cleaning up, burial of the dead in mass graves, and providing care for the wounded. 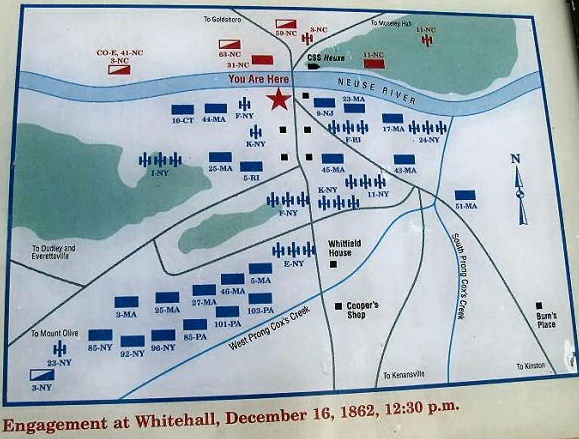 In recent years questions have arisen about the Whitehall battle, with speculation that many of the Union casualties were the result of friendly fire and that body counts were purposefully under-reported by the federal government. References: John G. Barrett, The Civil War in North Carolina (1963); CSS Neuse State Historic Site; W. W. Howe, Kinston, Whitehall, and Goldsboro Expedition: December 1862 (1890); L. G. Williams, A Place for Theodore (1997); Goldsboro News Argus, December 6, 1993; (Raleigh) News and Observer, October 22, 1991; NC Office of Archives and History. Recommended Reading: The Civil War on the Outer Banks: A History of the Late Rebellion Along the Coast of North Carolina from Carteret to Currituck With Comments on Prewar Conditions and an Account of (Hardcover: 243 pages). Description: The ports at Beaufort, Wilmington, New Bern and Ocracoke, part of the Outer Banks (a chain of barrier islands that sweeps down the North Carolina coast from the Virginia Capes to Oregon Inlet), were strategically vital for the import of war materiel and the export of cash producing crops. From official records, contemporary newspaper accounts, personal journals of the soldiers, and many unpublished manuscripts and memoirs, this is a full accounting of the Civil War along the North Carolina coast.